Whelped 2-17-11, 4 girls, 2 boys, Futurity Nominated. Pups listed in order of their birth, photos weekly. Puppy Name: Pups chosen in green. 1. "Honey" Female. Kennewick, WA. "Gracy"
2. "Max" Male. Bozeman, MT. 3. "Pepper" Male. Whitehall, MT. 4. "Penny" Female. Missoula, MT. 5. "Strawberry" Female. Ennis, MT. 6. "Lucy" Female. Choteau, MT. All 6 of the pups! Can you pick out which is which?? We as the breeders reserve the right of first choice. Meadow x Cooper: Click on this link for current puppy info. and photos. 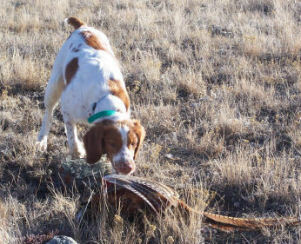 Med about to fetch a Montana pheasant she pointed. Kinwashkly Meadowlark, JH "Meadow" Whelped: 08/04/03. OFA GOOD, Elbows: Normal. OFA # BS-13202G33F-PI. DNA Profile #: V557681. By DC The Whiz Kid x Canadian DC Kinwashkly Sunshine Girl. Both parents are OFA excellent. Breeder Leslie Andreas. She is (as with all our dogs) a mixture of Dual Champion field and show lines that HUNT! Meadow is a medium sized female with medium bone. 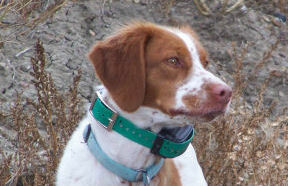 She is very birdy and intense as a hunter and has long gun dog range. Med fetches well in the field but, fetching toys in the house is a bit "beneath her dignity". She is a mellow couch potato in the house but a fire cracker in the field. Meadow has a nice touch with huns and sharptails as she often points from quite a distance. She enjoys agility and Sari enjoys handling her through her paces. Med has finished her Junior Hunter title, has pup and derby field trial placements, and is show pointed. She hunt, hunt, hunts!!! 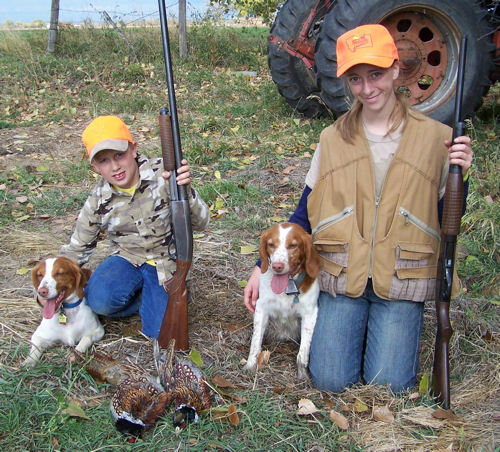 Maggie on the left with Wrangler and Meadow on the right with Sari on a beautiful fall Montana pheasant hunting day. His birth name was ‘Lucky’ because he was born by c-section several hours after his littermates on 9/27/2001. Actually, we were the lucky ones, because he stayed with us at Country Road Brittanys. As his happy, willing to please personality and independence became apparent; he earned the name of Rough Rider, or Cooper for short. Karen handled Cooper to his conformation Championship, finishing just short of his first birthday, on 9/6/2002. Cooper then moved to Tennessee to live with our daughter, Julianne. She began his training, and handled him to his juvenile wins. We hoped Cooper might be a dog that would be competitive in both the field and show ring. We made the trip to the Central Futurity in March 2003. Cooper won the All Age stake with Julianne handling. He was named Best in Futurity Show and the Dual Dog with Karen handling. This win gave our vision a running start, and sharpened our focus on the objective of the Dual Dog. 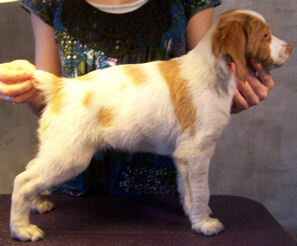 Cooper sired his first litter in 2003. 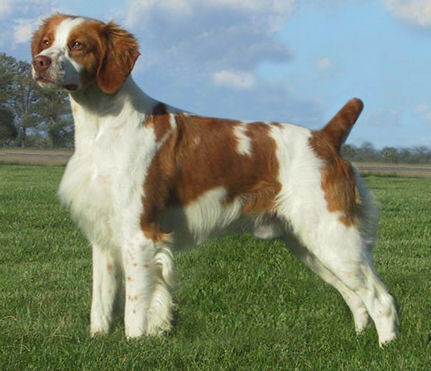 As his pups started competing in the field and the show, we knew he would contribute to the Brittany breed. His offspring are Dual Champions, Field Champions, Show Champions, National Qualifiers, hunters, and companions. Julianne ran Cooper the fall of 2004, but her work schedule limited their participation in trials. In June of 2005 we took Cooper to Bob Burchett, where he could run in more trials with a pro handler. Cooper finished his Field Championship on 4/28/2006, and thus became the ABC’s 500th Dual Champion. We were thrilled, but little did we know that Cooper had bigger things in mind. He was the ABC National Open Gun Dog Championship RU 2007, ABC Prairie States Shooting Dog Champion 2008, ABC Gun Dog Classic/Championship RU 2008, ABC Pheasant Classic/Championship RU 2009, and the ABC Gun Dog Classic Champion 2009. Cooper won the ABC Tri-Tronics Shooting Dog Award 2008, and was the ABC Masked Man Gun Dog Award RU 2009. Karen continued to show Cooper when he was home from the field in the off season. He earned multiple Best of Breeds, Sporting Group placements, and Specialty Best in Shows. Cooper amazed and overwhelmed us, as he put the exclamation mark on his career by winning the 2009 ABC National Specialty Show. Thanks to Nancy Morabito and Doug Tighe for your help. We are indebted to everyone who supported, encouraged, and cheered for Cooper during his field and show career. Thank you, Cooper, for taking us along for the ride of a lifetime!